Following Damage and the AEON series, can the DM-307 live up to Heavyocity’s high production standards? Mark Cousins finds out. Heavyocity’s adrenalin-fuelled sound libraries have received plenty of praise over the years, demonstrating a consistently powerful cinematic sound alongside some ingenious approaches to exploiting the dexterity of Kontakt’s playback engine. The DM-307 is the company’s latest release, pitched as a ‘modern groove designer’ and arguably representing an extension of and complement to some of its existing rhythmic libraries (Damage and AEON Rhythmic). However, as the ‘modern groove designer’ tag suggests, the DM-307 is considerably more than just a collection of pre-recorded loops, so we decided to take a closer look. Arguably the key factor that marks the DM-307 out from Heavyocity’s previous offerings has to be the new Grid interface, found as part of the Kit Grooves instruments folder. 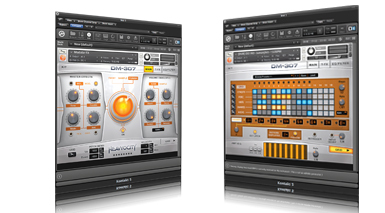 The Grid works as a form of five-voice drum machine, enabling you to sequence and abuse the collection of single-shot sounds included in the library. 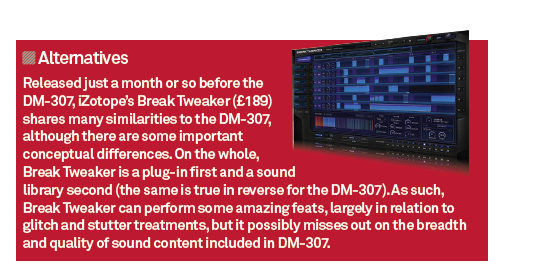 Ultimately, it means that the DM-307 is steeped in creative potential, especially by comparison to many loop-based libraries, with the various sounds and pre-programmed rhythms being just the starting point in terms of what you can achieve with it. Delving a little deeper into the Grid-based instruments included in DM-307, it’s interesting to note how much thought has been put into its feature set. For a start, rather than just being a one- or two-bar sequence, you can actually chain together a total of eight 16-step sequences, opening up the potential for long and complicated rhythmic patterns. We also enjoyed the fact that each track lane has a unique Sample Select parameter for each step, enabling you to establish a completely different drum sound for every 16th division. As you’d expect, the Step Sample parameter is a great source of pseudo-random rhythmic madness, but it’s also equally useful as a means of occasionally switching a snare or kick drum sound throughout the duration of a loop. 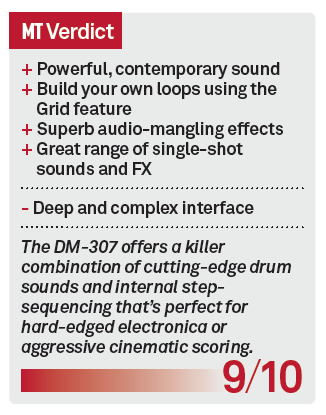 In total, the DM-307 includes more than 180 Kit Grooves all grouped by musical genre, with some particularly great examples in the Dubstep and Industrial Edge folders. It’s also interesting to note that the Grid can be triggered in a number of different ways from your DAW – using either B–1 to trigger the complete five-voice pattern, or individual notes as part of the same MIDI octave if you want to trigger each voice lane by itself. When coupled with the Trigger-FX options and Amp Sequences (which we’ll come to in a minute), you really start to release the live potential of the DM-307. 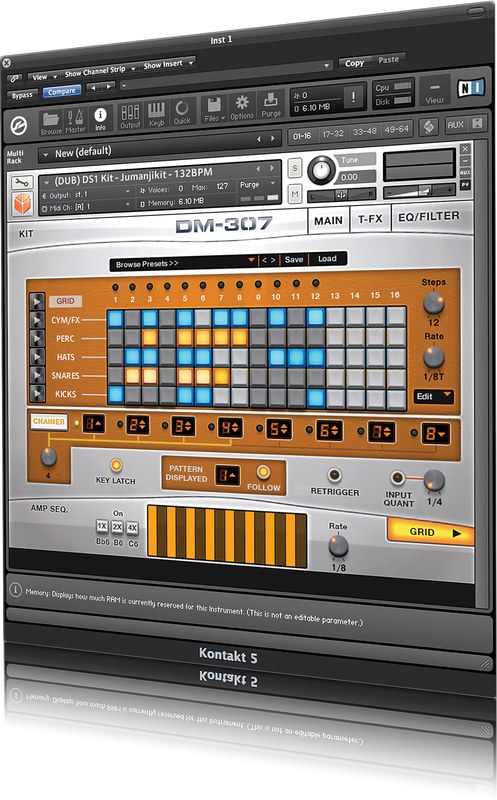 Beyond the Grid-based instruments there’s plenty of additional content that further extends the possibilities offered by the DM-307. The Kits folder, for example, provides an alternative means of accessing the single-shot drum sounds used to power the Grid presets, as well as an additional collection of impacts and FX sounds that add instant aural interest to any trailer-like composition. The Kits are ideal if you intend to sequence the DM-307’s drum sounds from your DAW, especially when using the Element Kits, which present the sounds by type, so that an instrument contains just snares, for example, or only kicks. As well as the 80 Kits, the DM-307 also includes 1,200 tempo-sync’ed loops, much like those included in Damage or the AEON Rhythmic collection. As you’d expect, the loops sacrifice some of the creative potential of the Grid system, but given that they’re presented in both in their complete form (as part of a suite of loops) and as a series of element-based loops, there’s still plenty of potential in terms of how you layer and trigger the rhythmic elements. Add to that an intriguing Loop Mutator – as first introduced in the AEON series – and you’ll find yourself having plenty of fun. Users of Damage or the AEON collection should be well aware that Heavyocity has developed one of the most feature-rich sound-managing engines to ever grace a Kontakt library. 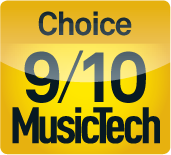 Rather than facilitating the static application of distortion, filtering, delay and so on, Heavyocity’s sound engine makes the process considerably more dynamic. Trigger FX, for example, enables you to add or remove FX blocks on-the-fly using a MIDI keyboard, even triggering an individual step sequencer for each FX block. There’s also an Amp sequencer as well (again, MIDI-triggered), which enables you to gate or stutter the sound in a rhythmic way – an effect that’s often used to great effect in many film trailers. For instant gratification, the large Punish and Twist controls found on the Main page are great fun, arguably making use of a hybrid of effects such as compression and distortion (in the example of Punish) to create a powerful and contemporary sound. Interestingly, on the rare occasion that you find the DM-307’s output slightly too harsh, it’s well worth turning down these controls slightly, as many of the instruments have a certain degree of ‘Punish’ applied by default. Although it’s hard to criticise such a deep and complex sound engine, the only possible issue for new users is the time it takes to fully understand the power behind the DM-307. Indeed, given the immediacy of the sound content, it’s conceivable that many users simply won’t have the requisite inquisitiveness to delve deeper, which is a shame as there’s so much to discover. 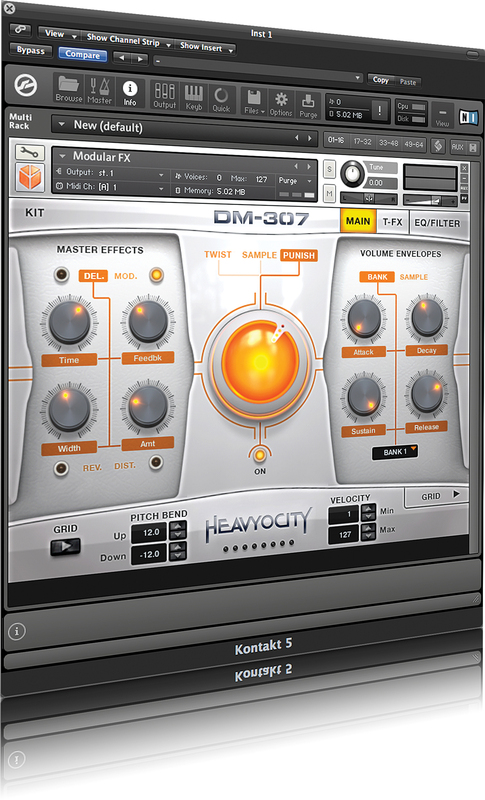 As with Heavyocity’s previous offerings, DM-307 demonstrates both an aggressive, upfront contemporary sound as well as illustrating just how much can be achieved using Kontakt’s sound engine. Inevitably, it’s hard not to draw some comparisons with iZotope’s Break Tweaker, as both products are based round a five- or six-voice step/drum sequencer. However, although Break Tweaker undoubtedly has the better engine behind it (especially in relation to its unique glitch and stutter effects), the DM-307 wins hands-down when it comes to the library content. 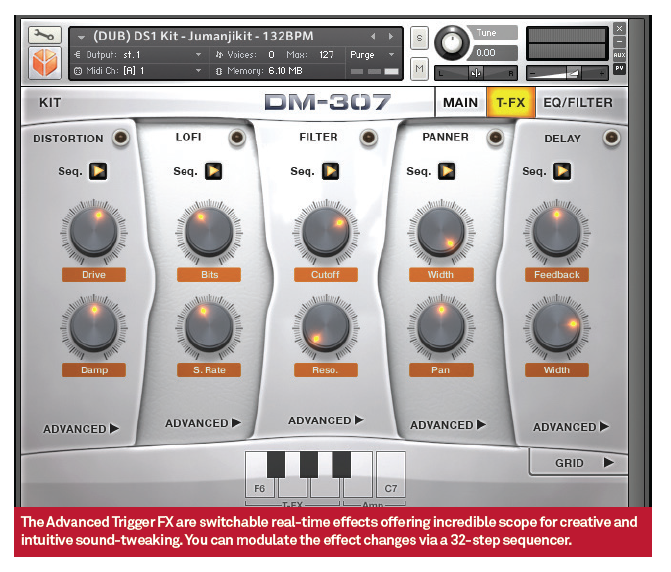 Pleasingly, for a market saturated with instant ‘one-finger gratification’, DM-307 offers an ideal balance between inspiring sounds and being a musical tool that you can adapt and use to your own creative ends. It’s also arguably Heavyocity’s most musically diverse tool to date – punchy and contemporary enough for hard-edged electronica, dubstep and drum & bass, but also equally adept as a tool for soundtrack composition, which has been a staple part of Heavyocity’s sound and approach from the start. 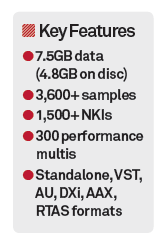 While the DM-307 isn’t the cheapest drum library going, there’s little doubt that you’ll need to spend several months exploring its various Kit Grooves, Loops, Multis and single-shot Kits before you run out of inspiration. Even then, some quick experimentation with the Loop Mutator or The Grid will immediately yield new sounds. Having set a high standard with both Damage and the AEON series, therefore, the DM-307 more than meets the levels of excellence we’ve come to expect from Heavyocity, and may well prove to be the company’s finest and most flexible library to date.